'To send peace, strength and positive connections to all those affected by flooding across the UK and beyond'. Christmas Day coincided with a beautiful full moon this year. This beautiful photo was taken from the garden of Old Nisthouse, here in Orkney, from where Crystal Earthworks is currently based. 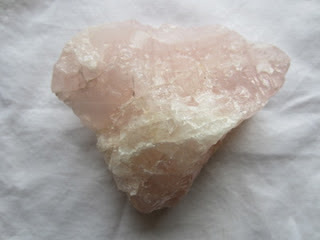 This meditation will use a heart shaped chunk of rose quartz. Hope you can join us from where ever you are based across the Globe. Stunning sunrise in Orkney today on the winter solstice. Many apologies for not getting the focus up for last night's meditation - one of our horses was taken ill so never got chance to get online in time. The meditation was for peace healing and positive connections for all those affected by flooding across the globe. This was in light of the unprecedented flooding in Northern England and the Borders at the weekend and in Chennai, India's fourth largest city last week. 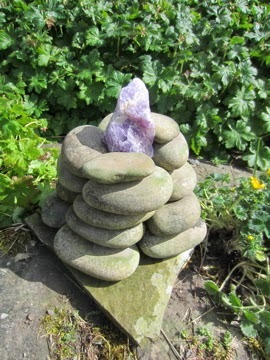 However the crystal cairn here at Old Nisthouse continues to be directed to helping all in distress across the globe. So if you would like to help others in need, please simply use the image below as a focus for meditation, prayer or positive thought. Hoping to stock a new way of using our programmed pyrite to protect against the negative electromagnetic energy effects of mobile phones and tablets in the New Year. Suitably sized, and appropriately programmed pyrite can be placed in a spiral cage as shown below and then attached to the device in the headphone socket. Unfortunately if you are using headphones you will have to carry or place pyrite in the usual way or get creative! I used pyrite in a cage like this with my mobile phone on a recent trip to London and it stood up well to being taken in and out of my bag or pocket and proved much more successful than trying to keep the pyrite with my phone in a silk purse as I had been doing. Still hopeful of one of the mobile phone/tablet manufacturers taking on board the use of pyrite and working with us to incorporate its use into their design. You can but dream! 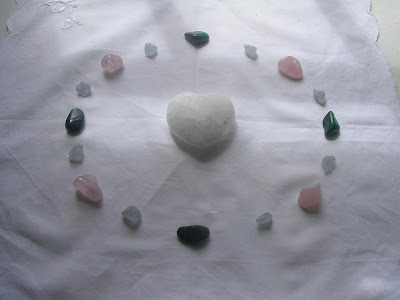 One or two of you have been asking about the new crystal used last night in the meditation configuration. 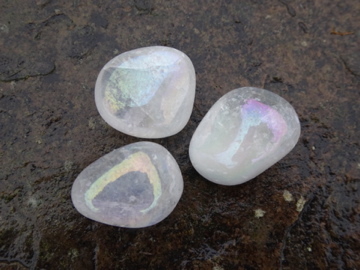 Angel Aura crystals are a new addition to the Crystal Earthworks aura work and they will be available in the New Year both to plant and for personal use. These beautiful pearly iridescent crystals are composed of clear quartz fused with silver and platinum. Their resultant vibration aids connection at the interface of Earthly and Angelic realms with a particular connection to current times hence the name 'Angel Aura'.